IT organizations of all sizes are looking for ways to reduce cost in their data center. While larger enterprises can more easily muster the necessary skills and resources in pursuit of this goal, mid-sized organizations typically have limited time and funds they can devote. 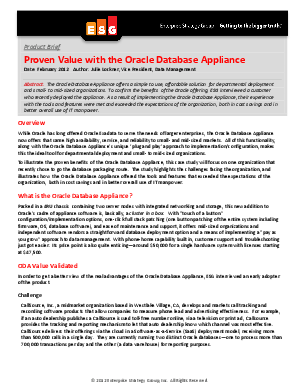 Consequently, for databases supporting business-critical operations, more and more mid-sized companies are turning to appliances - such as the Oracle Database Appliance. The Oracle Database Appliance offers the highest levels of database availability, without requiring the expertise traditionally associated with building and maintaining a custom high availability solution. This executive brief highlights the data management challenges a California-based organization faced and illustrates how their chosen solution resulted in cost savings and in better overall use of IT resources - and exceeded all expectations.